Hollywood casting Director visits BTS Performing Arts! 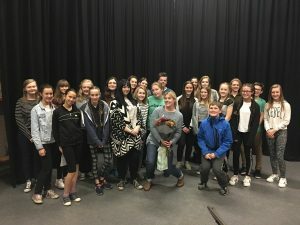 Students at our BTS Performing Arts session were lucky enough to have a 3 hour screen acting/audition technique masterclass with Kate Bone from three time Emmy Award winning Nina Gold Casting recently. Kate is part of the team at Nina Gold who has been responsible for casting actors in films such as “Bridget Jones Baby”, “Paddington”, “Star Wars – The Force Awakens”, “The Danish Girl”, “Les Miserables” as well as huge Netflix hit “The Crown” (the most expensive TV series ever made in the UK!!) and HBO’s worldwide smash “Game of Thrones”. Kate talked at length about the different approach and techniques used for screen acting compared to theatre performances. Each student made their own “ident” i.e. personal introduction at the start of any screen audition. They had also learnt a piece of script from various projects that Kate has cast, and were subsequently screen tested with Kate reading the other parts in. After each student had read we then got to watch the clips back on screen, when Kate gave individual feedback and advice. She was VERY impressed at the amount of talent in the room and looks forward to meeting our students again!! This was a BRILLIANT opportunity for our older students – as far as we are aware BTS Performing Arts is the only school for miles who offer this kind of training, aimed specifically at older students who are looking towards a career in the Performing Arts Industry.